Slow off-line measurements are not the only option anymore. Raman spectroscopy provides a fast and easy-to-use method for mineral identification and concentration quantifications revealing each material’s unique spectral fingerprint, the Raman spectrum. SpectOre product family is based on Timegated® Raman technology. It provides reliable, real time mineralogical information – fast, accurate and on-line without any sampling errors. Time-resolved Raman spectroscopy provides fast and easy analysis with material fingerprint. Raw material variability causes uncertainty in managing of the natural resource being mined. Separation of the valuable minerals from waste rock and gangue can save a lot of money. Currently, determining mineralogical composition is based on off-line laboratory analyses. 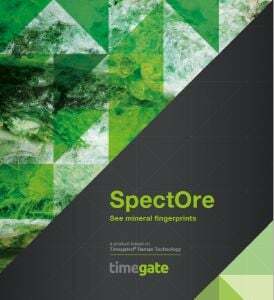 The SpectOre product family provides a viable solution for efficient, real-time and on-line / in-line mineralogical analysis for quality and process control purposes as well as for resource identification. Read more about using Timegated Raman in geosciences in the PicoRaman for GeoSciences brochure! Raman technology offers several useful advantages for process monitoring. Until now, the fluorescence interference has been a major limitation for the wider adaptation of Raman spectroscopy in process applications. Time-gated Raman technology offers real-time information about mineral composition of processed material flows. The SpectOre instrument can analyze and monitor flotation processes in mineral enrichment plants. High temperatures are often challenging for spectroscopic analyses. Time-gated Raman technology does not suffer from thermal emission interference so it can also be used at high temperatures. Timegate Instruments has successfully measured spodumene conversion rates during batch kiln furnace tests, where the alpha spodumene concentration was heated up to 1000 °C to yield beta spodumene. The information is needed for efficient conversion parameter optimization. See more about this application area in the Case Study of Keliber Lithium Project. "We have analyzed and monitored the alpha- to beta-spodumene conversion rate with various technologies with limited success. Timegated® SpectOre provides valuable information about the conversion rate. It is a fast and easy method and thus gives an advantage in process optimization. We got good results with the Timegated® SpectOre spectrometer and we are preparing to incorporate it as a part of our conversion process monitoring."